Summary An alien is sent to Earth on a rescue mission. 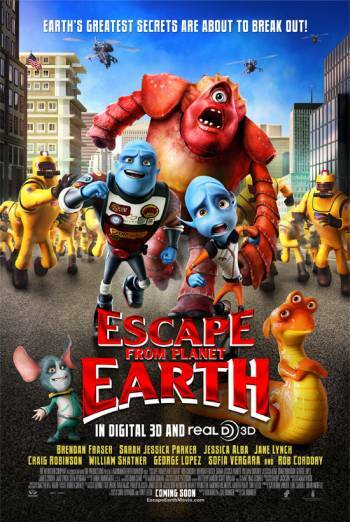 ESCAPE FROM PLANET EARTH is an animated film about an alien hero who comes to Earth on a rescue mission. The film contains several scenes in which good or heroic characters find themselves in danger, but these are brief and with reassuring outcomes, as the characters use ingenuity and resourcefulness to save themselves and others. Such moments include being controlled by collars around their necks, which give them shocks, or being shot with tranquiliser darts. They are sometimes required to fight their way out of fantastical dangerous situations, but the violence is very slapstick, with characters being thrown around and flying into objects. Occasional punches are exchanged but these are not detailed and do not result in serious injury. The film also contains a use of very mild bad language, when a character is warned of the consequences, "If you screw up this delivery".